What does 1 flipbook in the price list mean? 1 Flipbook subscription allows you to only use 1 online flipbook (it is not one flipbook per month). You are able to delete that brochure and add a new one; otherwise, overwrite that flipbook and keep the same link. If you need to use more flipbooks at the same time, you need to purchase more on the pricelist dropdown menu. You can always upgrade the amount of flip books/subscription type later on if needed. Click here to add more flipbooks. Are you able to bill me directly rather than having me pay by credit card? We accept/deny these cases on an individual basis. Please send an email to info@paperturn.com with your request and we will respond to you within 24 hours. What happens if I do not pay my subscription? Your publications will be deactivated; however, you still have the opportunity to login and update your payment info to reactivate your account. Refunds are honoured for yearly payments up to 5 days after payment has been taken with a penalty of 1 month's payment for administration and accounting fees. The account will remain open until the 1 month penalty period has ended. Refunds are not honoured for monthly payments. Our accountant would like to be included on invoice notifications. Are you able to add another email address to the billing account? Yes, you can. In your profile, go to "Billing Information" and then "Billing Address". Within that section you are able to add additional emails for billing purposes. How can I insert my VAT number for tax purposes? Did you insert your VAT no. when you created your account? If not, sign into your profile and visit the"Billing information" tab. Under "Billing Address" you will find the field "VAT NUMBER". Insert your VAT number there, and ensure to remember your country code in front of the numbers (ex. UK387367992). We have been charged 25% VAT and we are inside EU? Did you remember to insert your VAT no. when you created your account? If no please go to "Billing information" and "Billing Adress". Look for "VAT NUMBER" and insert it here. Yes, you do. You can either choose a monthly subscription or a yearly subscription. After you login to your account, go to "Account Settings" and then click "Terminate Account". You may terminate your agreement at any time; however, any money already paid will be non-refundable, as your Paperturn account will continue until the end of the paid period. Nevertheless, you will receive no further bills subsequent to this. When you terminate your subscription, you are canceling the automatic payments from your account. 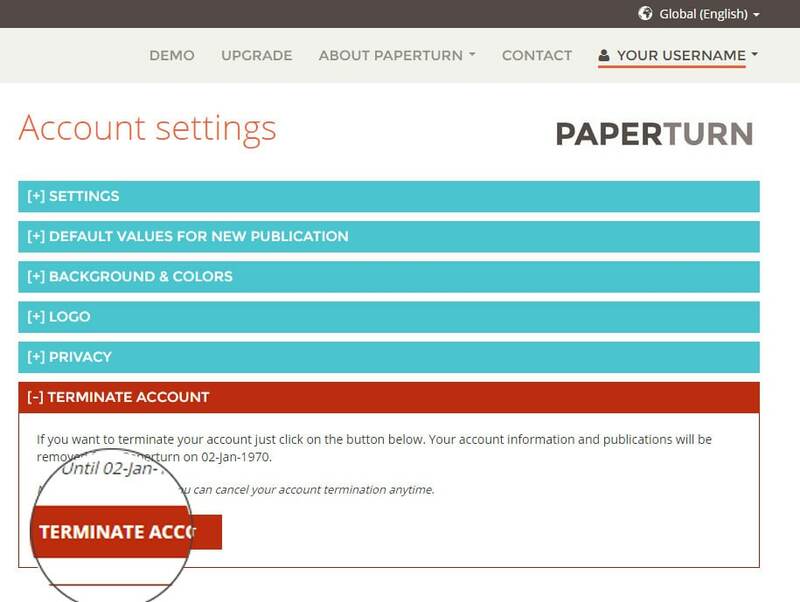 Your publications will stay online until the expiration date of your paid subscription. This means that you will not receive a pro-rated refund. After that, all of your info will be deleted. Can I upgrade to another plan later on? Yes you can. Upgrading to a more expensive plan will result in a pro-rated charge, according to the cost of your new plan.